Hakbi the Risen rare is located in Zuldazar open world Atal'Dazar on Zandalar isle. Ok this one can actually be hard to find. Especially if you are an alliance player and had never done horde questline. 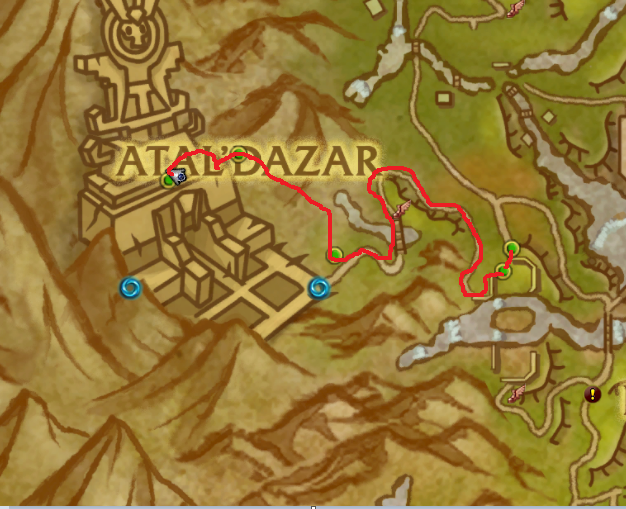 First you need to get near the Atal'Dazar Entrance and the road is pretty straitforward, but can be confusing for the first time. Start from the north entrance to the Temple of the Prophet and turn right. Take the stairs up and follow the road to the flight points and dungeon entrance. Near the Atal'Dazar Entrance you will see a small road on the north side of the mountain. Take it and it will lead you to the openworld Atal'Dazar. He dropped Golden Tomb Defender for me on the Beta. Hakbi the Risen rare mob can be found in Zuldazar. You might saw this one after The King's Gambit. If not, then start your way from Atal'Dazar meeting stone. Turn north from meeting stone, you'll see a path up to the hill. Follow the path, turn right and move under tree roots, there it is. Hakbi the Risen is a rare npc that is part of a world quest. I burned him down with my Paladin. He does cast bulwark which reduced his damage taken by 90%. Just kite him out of hit and continue to spank.